Translink has said a service linking north and south Belfast will form phase two of the Belfast Glider scheme. A route linking west and east Belfast as well as a route into the Titantic Quarter will officially go live on September 3 under phase one of the £90m rapid transport project. But Translink chief executive Chris Conway suggested that it could take £70m-£80m and several years before three new routes will be added. He confirmed that the next phase will include a route linking north and south Belfast, with some discussion over another service linking the universities. “Realistically, if funding was made available in 2019, it would take two to three years before it would be rolled out. You’re looking at that sort of time-frame at least,” he said. Translink has already recruited 100 new people to run the new service including 70 drivers and 30 ‘revenue protection officers’. The 18 metre Gliders are geared to run at seven minute intervals on new wider bus lanes that had been modified to allow for smoother journeys. Capable of holding 108 passengers, the new vehicles will also get prioritisation at traffic lights. Mr Conway said: “Generally everybody is really supportive of it and can’t wait to see it running. There’s still a lot of work to do and a lot of things to do, to make that fully operational on September 3, but we’re very much on plan to do that and committed to deliver that. 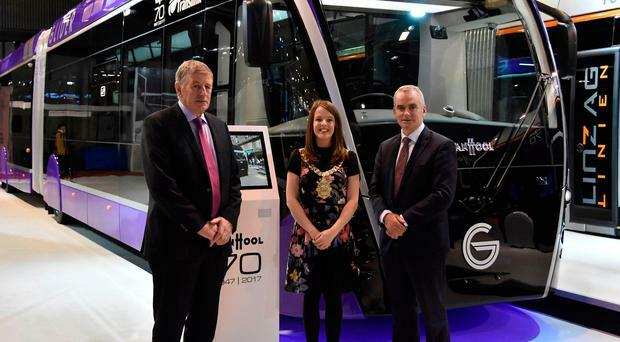 The chief executive said the new ticketing system being introduced for the Glider will eventually be rolled out across the Translink network, with the goal of introducing an Oyster card type ticket, similar to London, with contactless option. “All the research shows that it encourages more people to use public transport, when they find it easier to use,” he said.